We make chip dip with it. Mix a packet of soup mix with a container of sour cream. So yummy! Especially if you make your own cultured sour cream, I’ll bet this is amazing! guilt over the chips and not the dip too. Thanks! You can make homemade chips by slicing potatoes very thin and frying in a little coconut oil – I hear they come out awesome that way. I haven’t done it myself though. I always use the onion soup mix in my meatloaf, but have been hoping to find a homemade recipe for it. Thank you! I happen to have meatloaf on the menu this week, so I will be trying this recipe! p.s…I think I am on my 7th or 8th batch of your chocolate syrup recipe :). Yes, I am a chocolate milk-a-holic! So, I was very grateful for that recipe, too. could you share your meatloaf recipe please? I usually play it by ear, but basically use 2 lbs. ground meat (usually just beef, sometimes a little pork thrown it), 1 or 2 eggs, a heavy squirt of ketchup, an onion soup packet, and enough breadcrumbs to make it not too soupy. Then I press it into a bread pan and bake it at 350 for an hour :). Sometimes I’ll make it with ground turkey, a couple eggs, plain breadcrumbs, an 8oz. can of tomato paste, onion powder and celery salt. No onion soup in that one…it’s got a little different flavor. I’m so excited to see this recipe on here! My oldest son is allergic to corn, and virtually all “mixes” contain corn in one form or another. I’m visiting my husband’s family this week, and my mother-in-law made this delicious roast that had onion soup as the base of the broth. (No, my son didn’t eat it!) I’d made a mental note to find a homemade onion soup mix so I could make it again at home, and corn-free, and you surprised me with this! Thank you so much! My mother-in-law’s simple roast recipe- brown the roast, put it in the crockpot, sprinkle onion soup mix over it, add a small amount of water, add potatoes, carrots, etc. as desired, and cook all day on low. My roast recipe is the same, but I add 1/4 soy sauce. I also used to use onion soup mix with sour cream to make chip dip…but one my boys has major behavior reactions to MSG, so I REALLY try to avoid MSG (no Doritos! no canned cream of mushroom soup!) I’d been using your Ranch dressing mix for chip dip, but I’m so happy to have a homemade onion soup mix! Thank you for sharing! Take cube steaks and place 1/2 of them in the bottom of the crockpot. Use beef broth about 1 1/2 cups to pour over those, sprinkle 1/2 a pkt onion soup mix and 1 can cream of mushroom soup. Repeat layer with same in gredients and turn crockpot on low for about 8 hrs. This os great with mashed potatoes and veggies or salad! Forgot to say that you need to dip the steaks in flour and brown on both sides 1st! I think that’s an important step! This sounds great! I will try this for my husband. Thank you, Thank you and Thank you for this cube steak recipe. I have a whole deer of cube steak and have ran slap out of ways to cook it unless I repeat the same recipes each week. This is going to be cook on Monday!!! I am planning a post on my blog about all the ways to cook cube steak can you give me a web address or something so I can give you credit? land when I was looking for easy crockpot meals. practically melt in your mouth! My husband LOVES these! I don’t think I have ANY recipes that call for onion soup mix! But this looks so good! I can’t wait to make it and then go find some onion soup mix recipes! I dice up several potatoes and place them on a baking sheet or in a 13×9 dish. Sprinkle with the onion soup mix and then drizzle olive oil on top. Bake at 400 degrees for 20-25 minutes. I love that they are so easy to make. I can’t wait to try this recipe for soup mix! I love to make baked french fries (similar to your recipe above) w/ Laura’s ranch dressing mix. We love it! I’m definitely trying it w/ the onion soup mix next time for a change of pace! I use it in a crockpot meatloaf recipe from southernplate.com. Delicious!! Can’t wait to try it with this homemade soup mix. I also use it on roast in the crockpot and for dip. Thanks for the recipe!! The roast recipe my Mom has made my whole life…and my Gram before her! Take a frozen beef roast. Yes, FROZEN is important! It makes for a *much* more tender cut of meat. Anyway, take a frozen roast, put it in a roaster pan, pour a small amount of water over it, sprinkle with the equivalent of a pack of onion soup mix, roast at 350 for the normal amount of time. Delicious, simple, and now extra healthy thanks to your onion soup recipe. FYI, for those who don’t want to make it themselves & have access to Frontier Co-op they also have a great organic, MSG free onion soup mix that you can purchase in 1# mylar bags. Thanks for all your great, healthy recipes! I like to put a roast in the crockpot (usually frozen), mix a packet of onion soup mix with 2 cans of cream of mushroom soup and pour that on top. Cook on high for 6-8 hours. Makes a wonderful gravy. I sometimes add a can of mushrooms and some small whole onions as well. Serve with mashed potatoes, a green salad, and a loaf of fresh French bread. One of my kids’ favorite meals! We do that too, but I found out how to make homemade cream of mushroom, so I’m planning to make that using the homemade onion soup mix. 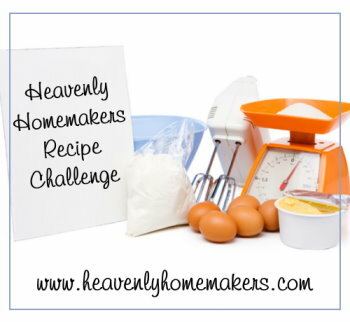 Yay for Heavenly Homemakers! I’d all but given up on being able to make this dish again because of all the “bad for you” ingredients. I’m so excited I can make this again!!!! I put it in my hamburgers before I grill them! We put a roast and root veggies in a crock pot and put cream of broccoli soup and onion soup mix over it. Just let it go for 8-10 hours in low. You end up with a really yummy broth that you can pour over your pieces of roast. I’m so excited to try this. My husband loves onion soup mix, but I really hate buying it because of all the junk in it! We use it in chip dip, roast, and to make “dirty” potatoes. I’m sure we’ve thrown it in other things; I just can’t think of anything else right now. I wanted to let you know that I make sooo many things off of your site. Thanks for all the great recipes. You are helping to make my family’s transition to eating healthier a lot easier! mix rice, crm of chicken/celery soup (or whatever you have), at least cup of milk and put in a greased pan (portions can vary). Place seasoned uncooked chicken breasts (salt, pepper, paprika) on top of rice (or immerse if you prefer). Sprinkle entire dish with Onion Soup mix. Cover and bake no hotter than 325 for 2 1/2 hours. (I do 275 for 3 hours) This is an entire family favorite! My favorite roast recipes uses onion soup mix. You take one packet of onion soup mix, one can of cream of mushroom soup and 2 cans of water. It makes the best flavor in the roast, carrots and potatoes, or whatever you like to throw in there. We’re actually having this roast tomorrow for dinner. Potatoes! Cut them into wedges, drizzle with a little olive oil then shake the mixture on top and bake. YUM!!! Hey! I can do this one! I think I have everyone of those spices in my cabinet right now. My daughter and I could do this one afternoon together. Thanks so much. I only have one recipe in my repertoire that calls for onion soup mix – spinach dip that is very yummy! Thanks for the recipe. Place pork in slow cooker. Mix all other ingredients together and pour over pork. Cook on low setting for 4 hours. Serve with cooking liquid on the side as au jus. I like to shred the pork and mix it in the cooking liquid. Great on a roll as a sandwich, too! Perfect timing! I bough a pork roast on sale to use for dinner tonight. It is sitting in the fridge and I had no idea what to do. Thanks for the recipe! Mix together, patty, and grill. They taste delicious, are juicy, and after I make the patties, my husband does the grilling! When I make this recipe, I use oatmeal instead of bread crumbs. Thank you, Laura (and Vicki), for once again adding something of real value to our day! As Holly mentioned in the comments, I’ve been a fan of the Frontier mix for quite a while. Unfortunately, I haven’t belonged to a co-op that ordered from them for a few years. It’s been hit or miss in getting it. I’d much rather be able to prepare my own mix anyway. Thank you for blessing me….again, Laura. I will remember you in my daily prayers today as I give thanks for so many things. As far as corn tortillas go, you want to make homemade masa or masa harina. There are lots of tutorials online for how to do that. You soak corn in lye to make it more digestible, then grind it into a paste. That is pretty much it. A tortilla press is very helpful for forming corn tortillas, and they cook best on a hot cast iron skillet. I hope this is helpful, I live in a community with a large Hispanic population, so corn tortillas are very common here. Definately Use Masa Harina–Bob’s Red Mill makes a good one. Also the key to getting them to stick together (according to traditional Mexican Cooking) is to add boiling water to your Masa harina–add all of your dry ingredients and stir into a bowl–then add boiling water and stir like mad!! Let it rest for about 1/2 hour and then roll out into tortillas and toast them in a dry hot cast iron pan–That has produced the best results for me! this is a great recipe to have on hand-thanks! I think there is only 1 recipe where I use onion soup mix…Beef Stew. I combine beef stew meat, potatoes, carrots, 8 oz. tomato sauce, 1 packet onion soup mix, and 1 tbs tapioca (to thicken the sauce). You can put it in the crock pot on low for 8 hours, but I like it better in a 325 degree oven for 2 1/2 – 3 hours. Sometimes we add fresh green beans to the stew 1/2 hour before it is done. YUM!! Thanks so much Laura. I made hot beef sandwiches last night for supper and it pained me to use a packet of onion soup mix. Now I have the perfect substitute for next time! I use onion soup mix in my hamburgers. Take your raw ground hamburger, throw in some onion soup mix and mix well. Shape into hamburger patties. Yummy!! Thank you! Thank you! Now I don’t have to ration my few remaining packets of onion soup mix, while living in Southeast Asia! I use it in meatloaf, pot roast, and even stroganoff…the return of our favorite dishes is imminent! Its my simple lazy crockpot meal. You need a chuck roast, onion soup mix, garlic, water, and cream of mushroom soup. Take the beef and brown it on both sides (to keep juices in, but I’ve skipped this step and its still good). In the crockpot mix one packet of onion soup mix, 1tbsp-ish of minced garlic, can of mushroom soup, and 1/3 cup of water (ish). Add beef and turn to coat. 6-8 hours on low. The “sauce” makes a delicious gravy! I like to serve it over egg noodles. So happy for a healthier “onion soup packet!” Thanks! Beef Brisket! Place a brisket on a large piece of foil. Fold foil in such a way that you can pour a bit of liquid over the meat and it will hold it all in. Sprinkle one envelope onion soup mix over the meat. Slice one onion and lay that over the meat. Slice either fresh mushrooms or use canned and put those over the meat. I like mushrooms so I use quite a few. Pour a scant 1/4 to 1/2 cup(depending on size of brisket)of beef stock over meat and tent the foil and crimp it to keep in all the juices. Place the whole packet in a roasting pan and bake low and slow. 275-300 degrees depending on your oven for about 4 hours. YUM!!! That looks *so* yummy! We can’t buy packaged onion soup mix because my son has a dairy allergy, but yours will work. :) Back in the days when I could buy onion soup mix, I used it in my crockpot roast beef. Yum! 1 T. onion soup mix. Do not add water! Makes it’s own delicious gravy. Seal and can at 10 lbs pressure for 60 minutes. Works well for last minute meals like stroganoff, soup, hash, etc. Definitely potatoes. Just like your ranch potato wedges, only stir them taters with olive oil and onion soup mix. YUM! Before I was diagnosed with multiple allergies, I used to use onion soup mix to make shredded beef. Put in crock pot min. of 8 hours on low. So many people loved it that I HAD TO bring it to every potluck and holiday. I know now what we’re having this weekend now that I have a safe replacement for Onion Soup Mix! I add a packet of onion soup mix to my sour cream before putting it into my poppyseed chicken recipe (this is for 8oz. of sour cream, I use a half packet if only making a 10×10 recipe). Everything else in the recipe is the same, but the soup mix gives extra flavor and everyone always asks me how I get so much flavor in my poppyseed chicken. I make my own cream of chicken and hated adding the packet of soup mix….I can’t wait to make my own this time around. My husband will be thrilled with the ingredients as well! I added onion soup mix to your cheesy beef and rice casserole for a little extra flavor (because I have a similar recipe that calls for tator tots instead of rice and uses onion soup mix). My husband and I loved it! I’m loving all these ideas from your readers! The only thing I put onion soup mix in is our grilled burgers. I am definitely going to mix this up and try out some of these other great ideas! I used to use onion soup mix in my pot roast (it makes a delicious little gravy as it cooks) but stopped using it because of the unhealthy ingredients in those packets. So this is going to be a wonderful convenience and a welcome addition back in the kitchen. Thank you so much! Laura! Thank you so much! My youngest son has a gluten intolerance and I could never find a good, healthy gluten free alternative! You rock. Thanks for working on this! Combine and bake in oven or slow cooker- the sauce is SO GOOD on with rice!! We put the onion soup mix over chicken and add rice, green beans, mushroom soup (Pacific makes a good msg free one)you can make a great mix with powdered milk and add mushrooms. Add a touch of braggs and it is wonderful! So, I have tumeric in my spice cabinet that has been driving me crazy. I don’t know where it came from, I can’t throw it away, and I don’t know what to do with it. Until today! I’ll make onion soup mix! Yay! Chip dip here too. Years ago my mother made an awesome cheeseball with the onion soup mix, nuts and cream cheese. The best is onion potatoes. Cut up potatoes into chunks and put in a large container or bag. Add a little olive oil and a lot or a little onion soup, shake, and pour into a baking dish. Bake at 350 until (I prefer) crispy. It’s usually about 40 mins. Or you could cook a shorter time for softer potatoes. YUMMY and one of our fav side dishes! Set on low for 6-8 hours. Sometimes I add baby carrots in the beginning and mushrooms near the end. Simple and delicious, my family loves it. Oh, yay! I love to make Apricot Chicken, using 1 packet of onion soup mix, 1/2 -1 c. apricot jelly, and about 1.5 cups russian salad dressing baked in the oven about an hour and served over brown rice. So delicious and easy to make! I even make it for company and it always goes over well. People can’t believe there are so few ingredients, but I haven’t been making it because of the soup mix. So excited, thanks again! I’m a new follower and I love your recipes. Thanks for being a guiding light–been looking for an onion soup recipe for a long time. I wanted it mostly for roast beef, but I stopped buying the roast because I didn’t want the MSG. Now I can start buying it again–yum! Can’t wait for you to post your one-dish stew recipe. Sniff, sniff (wipes tear) — THANK YOU!! I love adding onion soup mix to chicken soup and beef stew to help flavor it. I’m so excited to try this and I’m only missing one or two little things! We add Onion Soup Mix to our meat when we grind our wild game into burger. It tastes sooo yummy and simplifies food prep! Even friends who don’t like the taste of wild game will eat our Onion Mix Burgers! We grow all our herbs, garlic and onions (and dehydrate them) so I’m excited to try this recipe! Also, can’t wait to try it with creme fraiche (sp?) for Onion Dip!!Thanks! Its amazing how much I miss being able to just buy those little chemical filled packets o flavor! Thanks for this very yummy alternative! Combine in crock pot and cook on low 8-12 hrs. Serve over noodles. Good over mashed potatoes too! Thank you, thank you. I had forgotten how “way back when” I would sprinkle 1/2 packet over chicken in the crock pot. Just today I got an msg headache from eating out with out-of-town(country) family at a barbeque place :(. I just hope it doesn’t trigger a migraine! I use Onion Soup Mix all the time!! I think I have now convinced my hubby to allow me to spend the money on some glass jars!!! of course, that is all I can think of off the top of my head!!! YAYAY! I have been looking for a recipie for onion soup mix! I like to add it to my roast and other beefy meals.. and have refused to buy it… THANKS! Dip made with sour cream and onion soup mix is a comfort food to me. Great childhood memories of eating this dip! Thank you so much for the recipe! I’m going to mix some up to keep with my ranch and taco seasonings. I use onion soup mix to make dip (with sour cream, as others have mentioned), meatloaf, and with oil to top potato wedges that I then bake. The latter is amazing with roasted chicken. Brisket with 1 tbsp of dijon, 1 Tbsp plain mustard, and onion soup mix. 1cup water. Add carrots and potatoes if you like.Crock pot for Sunday dinner. Mix together and pour over chicken. Cook on low in a slow cooker for 6-8 hours. Serve over wild rice or mashed potatoes. Yum! Hi sugar, love your website, have been copying down recipes for Taco Seasoning and Onion Soup Mix! They would be such nice gifts! And I love the idea of making stuff without all the additives that commercial mixes have in them! Madge Miller sent Mom your latest articles and we just love them! YOU are SO TALENTED. Oh dear is this public? Yay! So fun to hear from you here on the website! Love you too! Woo hoo!!! I’ve gotten to the point where when I see “onion soup mix” in the recipe, I just move on. I am making my shopping list right now! I’m going bulk spice shopping (my spices are in need of replacing) and making some onion soup mix, ranch dressing, and taco seasoning! And I love the idea someone had of making gifts out of these, I’m jumping onto that! So excited to have discovered all you have to offer!!! Thank you so much for this! I, too, have had the problem of finding a mix recipe with no MSG. I, too, suffer from the MSG migraine. One recipe I do that I didn’t see anyone else show is Salisbury steak. I combine onion soup mix, brown gravy mix and a can or two of mushrooms (with the liquid). This forms the gravy for the steaks. Then I just cook some hamburger patties and smother it in gravy. It tastes so good, but I don’t love the headache. Now I get both! Whoot! The sad thing is, so many people don’t ever notice that most canned soups, as well as the mixes for soups- like Onion Soup Mix- and dips have MSG. 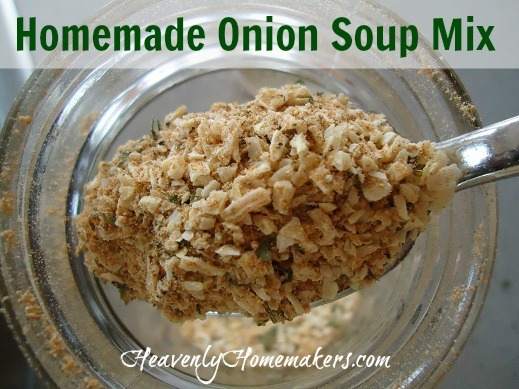 I am SO happy to see this healthier recipe for Onion Soup Mix! Thank you. YEAH! I now can make a healthy version of onion dip with plain organic yogurt. WHOOHOO! Roast that makes it’s own gravy! 4 TBS. of onion soup mix, worcestershire sauce (some poured over the top of roast), a can of cream of mushroom soup (can make your own home-made), and of course a roast (I have used all cuts-beef and venison). This makes it’s own gravy and the roast is soooo tender! Yay, I was excited to find this page with the recipe for an alternative to onion soup mix. I can make my husband’s favorite meatloaf dish now. Thanks for posting this. Slow Cook Tri Tip Roast (or Brisket) THE BOMB! Place roast in a 9×13 baking dish. Mix soup with juice and sauce to make smotth paste and spread over meat. Cover tightly with foil. I praise God for your site! you are an angel! I add onion soup mix to my roast. I take my roast, and sear it in hot oil then remove it to a large pot; then I almost cover it with water. To this I add the equivalent of 1 onion soup mix pkg. After simmering for 3 hours or so I add carrots and potatoes to the pot. It makes the perfect roast and the onion soup mix broth makes awesome gravy for the roast and flavors the potatoes and carrots as well. I just used this on a roast (used 3 TBS per 2 lbs roast) along with a cup of water and a TBS or 2 of Worcestershire sauce. Cooked on low in a crock pot for 8 hours… then served on toasted buns with swiss cheese! Reserve the juices for dipping! It was delish and MSG free! I think this is the 2nd or 3rd time I’ve come back to share how I’ve used your onion soup mix! Today I used it to flavor my vegetable soup. I used about 3 TBS for a BIG pot of vegetable beef soup! SO Yummy! Thanks for these great recipes! Ok, I have such a long list of recipes to try now! I love your ranch mix, pancake and sausage muffins, and I will try the mushroom soup recipe soon. Now that I see this recipe, I can make one of my husband’s favorite childhood meals, 1-in-1 casserole. 1 cup of rice, 1 can of cream of mushroom soup,1 pack of onion soup mix, 1 pound of ground beef. All his mom did was throw it in a casserole pan and cook till the rice was done. YUM! I altered it a bit by cooking the beef 1/2 way so I could drain the grease. Then I had to add some water (1 cup?) to make up for the grease so the rice would still cook right, because ewwwwww, I could not eat that soaked in grease LOL! At what temperature and for how long is it cooked? I might make this tonight. Sorry, I have no idea on the timing! It has been several years since I made it (due to MSG). The temp was 350, and it was between 30min-1hour. Put rice in the bottom of a 9×13 inch pan with half of the onion soup mix. Add soup mixed with 2 cans of water. Place chicken pieces on top and add the other ½ of the soup mix. Bake at 350 for 1.5 hours, first hour covered, last half hour uncovered. So, I just mixed this recipe up but I discovered to my chagrin that I don’t have turmeric in the house. Does this add much flavor, or is it there mainly for the color? I’ll add it next time I go to the grocery store, but if I make the meat and potato dish you posted, will I notice that it’s missing? It shouldn’t make too much of a difference. I think it will probably be just as good without it! How about actually using for quick soup? I looooved onion soup when I was a kid, but i can only find it now in bpa filled cans or msg filled mixes. I can’t wait to try this mix for general cooking, but I’d also like to try it for actual soup. Should I add beef stock as the base? Just tried this soup mix with one of our homegrown, grass-fed beef roasts and WOW! The meat and veggies were so flavorful! Such a difference from the Lipton soup I used to use. Love how much healthier this mix is and that I can make it in large batches so inexpensively! Thanks for coming up with this recipe!! Is there a recipe for homemade cream of mushroom soup? Don’t like to buy the store brand..
Can’t wait to try this. As someone else said, I typically just move on when I see recipes with onion soup mix. My 4 yr old is gluten/dairy/soy/MSG(and all the other “artificials”) free, and so I haven’t bought the stuff in forever! Between the chemicals and fillers in it we can’t use it unless I want to cook 2 separate meals every meal (which I am not willing to do!) I look forward to using this soon! I serve with garlic mashed potatoes, glazed carrots, salad and rolls or mashed potatoes and Yorkshire puddings. GREAT DINNER Can fix to serve many…When we have kids and grands its eleven and we make enough for leftovers cause makes great sandwiches next day. It is awesome in chili. then pour over meat and simmer for 5 min on med. heat. Simmer for about 1/2 hour. Roasted potatoes. Cube potatoes, add onion soup mix and drizzle with olive oil. Stir to coat. Bake in oven about 45 minutes at 400*F. Flip potatoes about half way through. Sprinkle with a little parm cheese when they come out of oven. Can you make this without the sugar? We have trouble with yeast at our house, so looking for “no sugar” options. Thanks! Sure, that would work fine! I just used this to make a pot roast in the slow cooker! My husband LOVED it! 1. Stir the mushroom soup, soup mix, potatoes and carrots in a 4 1/2-quart slow cooker. Add the beef and turn to coat. 2. Cover and cook on LOW for 8 to 9 hours* or until the beef is fork-tender. 3. *Or on HIGH for 4 to 5 hours. our slow cooker is 6 quarts, so i left mine on high for 3.5 hours and it was perfect! Eye of Round Roast — delicious! Thank You so much for publishing this recipe, I buy alot of beefy onion soup mix, now I can saved money and make my own…I use it in meatloaf, vegetable beef soup, strognoff, anything made with beef, I love it! Great idea! Just found this from your soup post at Stacy Makes Sense. Going to Pin it, thanks! I add some to my potato salad. Also, I have a recipe for beef roast that calls for onion soup mix and cream of mushroom soup. As it bakes, it creates a gravy for the roast. (Too bad I don’t use craem of mushroom soup any more.) Chicken or turley with rice is a casserole I use onion soup mix in. I think that is about all I use it for. Hi I just found this website and I’m really looking forward to making the multiple recipes on here! Just a quick question, what is turmeric and is it easy to find? You should be able to easily find it in the spices section at the store. I plan to use a recipe for pork tenderloin in the slow cooker that calls for onion soup mix. I will replace the packaged with the homemade. One of our favorite family meals is “Beer Beef”. In a crockpot place a beef roast (I usually use bottom round roast), a bottle of NICE beer (Not mass brewed American beer! ), and one packet of onion soup mix. Cook on low 6-8 hours (or high 4-5 hours) until the beef is tender enough to pull apart. Once it has been pulled apart warm it for about 30 minutes-still in the crock pot. Serve on nice Hamberger buns with mustard and relish. We can usually serve a family of 14 (that’s why I make it when we are ALL together!)!!! So it goes a long way! I cant believe I finally found a onion soup mix recipe that doesn’t call for the nasty little bouillon cubes or instant bouillon! Every time I have used it I feel like I am using a little cube of chemicals. I am definately going to use this recipe, which I use in soups, on chickend, on steak, in casseroles and lots of other things. I will share it with everyone I know. Thank you so much for sharing it with us. Have a blessed day. How much does this make? I’d like to make some to give for Christmas gifts! Would the recipe for the onion soup mix suffer if you omitted the sugar/sucanat? Nope, that will be just fine! thank you so much for this i have been using this at least once a week now ! Thank you so much for sharing this! I’m so excited to try it. We make chicken strips with it. Mix one packet of onion soup mix with 3/4 cup bread crumbs. Dip chicken strips in melted butter, then in bread crumbs/soup mix. Bake at 350 for 10 min, or until done, turning over 1/2 way through. We love this recipe and make it almost every week, so I’m excited to have a way to make it healthier. Used to use it for tin-foil dinners for camping and bonfires. That was before I stopped eating canned soup, dry soup mix and beef! Now I think I’ll try them again with this recipe, your soup recipe, and soy “sausage” crumbles! I did not love this recipe. I think it was the turmeric, it was all I tasted and I only used 1 tsp. I would try this again, omitting the turmeric, adding several garlic cloves, and slightly more salt. Thank you for a base to start with! We like this recipe, the taste is just great. My only complaint is the sour cream turns yellow after a day or two (if I use it for chip dip), I am assuming that is the tummeric. So I think next time I will make it without the tummeric and see what happens. We just made this today for the Superbowl and it is terrific. I used a little less tumeric, only 1/3 teaspoon, but that’s the only change I made. Very good recipe, thank you! Thank you for this recipe! We use it in meatloaf, hamburgers, ham loaf, beef bar-b-que, pot roast. Probably some others, as well. Yummy! Thank you! We sprinkle it over potatoes before frying, mix it with panko and potato flakes for a shake-n-bake, mix it into our gravy, sprinkle it on popcorn with a little sesame oil, mix with shredded cheddar cheese and fold into dough for tasty biscuits or dumplings… I love this soup mix- not only does it make a delish soup, but adds so much flavor to almost anything I whip up! I made this recipe last week and tried it with sour cream to make chip dip. We are not pleased with the results. I’m not trying to leave a bad review or anything… but I just wanted to warn anyone who thinks of using it this way – it’s not very good! Thank you. Any idea for good homemade onion soup mix that works well with sour cream for a dip? Try Laura’s homemade Ranch dressing recipe. I just made it last night as a salad dressing – the boy loved it to dip his chicken nuggets in and hubby & I enjoyed it on a salad. Made a command decision then and there to make it as a veggie/chip dip for a shin-dig we’re throwing this weekend. Mrs. 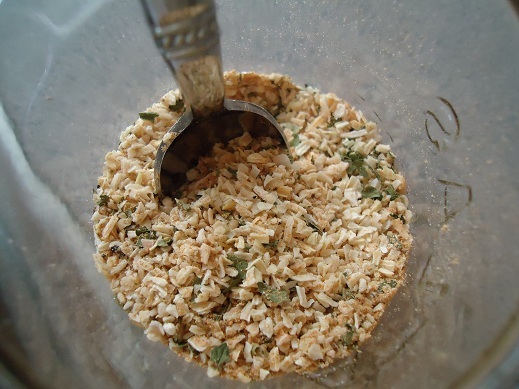 Dash makes an onion seasoning blend that works great for an onion dip!! Blend the sour cream and onion soup, then stir in the blue cheese and walnuts. I tried it as a veggie dip and it was terrible, but I tried it a second time and left out the turmeric. It made all the difference for us! I use mostly yogurt and sometimes mix in sour cream or mayo depending on what’s in the fridge. A few tablespoons of the soup mix and I’ve got a delicious dip! I knew when I saw the recipe it wouldn’t work for the dip which is what I use it for most. The packet has beef base/bouillon in it and without it is nothing like the packet. I make onion dip with Mrs Dash onion seasoning, it works very well. Can you tell me how to make just one packet of onion soup mix with these ingredients? Thanks! Do you have an email sign-up? This recipe makes approximately 4 packets of mix so just divide by four for a single packet. I used this recipe in a pot roast last week it was fantastic. I just used the onion soup mix to make dip with sour cream. Love it better than the store bought mixes. Then again our family loves turmeric. I’m looking for a homemade “au jus” recipe to add to my Italian beef Crock pot sandwiches. Any chance you’ll tackle that next? I have been using this recipe for about a year now and love it! I use it mostly for making onion dip. Just let it set over night, mixed with sour cream, to soften the minced onion and Viola great tasting Homemade onion dip. Friends and family all love it. Laura, I use onion soup mix simply over a roast with a 1/2C water in the slow cooker, or I’ve even added into my meatloaf. The onion water from the roast makes a great gravy afterward too. It is great in hamburgers or meat loaf too. I use it w/a roast and it really gives the meat and gravy a great taste! I am so excited to try this recipe! I use onion soup mix in my meatloaf, a seasoned rice and chicken dish, creamy crock pot chicken, and of course a dip. There must be more, for I have felt lost since realizing it had MSG in it, and wanting to cut it out of my pantry. Looking forward to trying this recipe!! My favorite recipe with onion soup mix is company chicken: 1 c yellow rice, 1/2 c water, 1/2 c orange juice (mix all that in the bottom of 9×13 pan); add pkg of chicken thighs on top; sprinkle one pkg of onion soup mix on top; cover with foil; bake at 350 for 1.5 hours. Thank you from the bottom of our hearts. I am terribly sickened by ingesting MSG as are countless relatives, friends and tens of thousands of others. Your Onion Soup Mix is wonderful! We look forward to following you! Thank you for this recipe! I’ve been trying to recreate the original, but wasn’t having much luck! Our favorite way to make pork tenderloin is to cut it into 1-inch pieces, sprinkle with 1 “package” of onion soup mix, add 1 cup heavy whipping cream & bake. Serve this over your favorite type of noodle or rice! Enjoy! Your recipe sounds good. How much pork, what temp, and bake how long? I scramble fry beef and onions and add mushrooms after a bit. Then the onion soup/water mix. Boil until sauce thickens to your liking. Add your vegetables and simmer for a couple more minutes until veggies are tender-crisp. Add parsley,stir and serve over fresh steamed rice! We were running low on ingredients one day and this is what I came up with as I was rummaging around my pantry. We love it! This sounds like a great base for a Shepherd’s Pie or a Beef Pot Pie! Love your recipes! I was going to make some of your spice mixes as gifts. What size jar do you recommend? Thanks! I have this recipe I make in the crock pot that involves a packet of onion soup mix, 1/2 c of prepared Italian dressing and 1/2 c of water plus chicken breasts. I made it a few nights ago and we were eating the leftovers tonight over rice but there wasn’t much of the soup/gravy left and I didn’t have a packet of onion soup mix so I made this and it was so so so so so tasty. Thank you. Never going back to packaged soup mix. I am using it in place of the store bought kind in my husband’s favor bread made in my bread machine. It is a quick bread so it only makes 58 minutes and is better than bagels in the morning. 2# loaf: 1.5C warm water, 3Tbl oil, 3Tbl Sugar, 4C bread flour, 3Tbl dry onion soup mix, 2Tbl quick rise yeast – easy and fast! I use it for my salisbury steak recipe that my husband loves. Thank you!!! Hello, thanks for the recipe without the bouillons! I can’t wait to try it. I have a question: I was wondering if I can sub the minced onion for more onion powder? Thanks, again. I plan on using this for mini sliders that I make for my children. It’s healthier, and I want them healthy. Thank you so much, I can’t wait to try it out in tonight’s meal. I use all your mixes recipes and love them. They are great no msg, no perservatives and no coloring just great flavor. One hint on the onion and ranch if I am using them for dip I put the spices through a grind on an extra coffee grinder. Combine first four ingredients and pour over roast in crock pot. Cook on low for 12 hours. Along with no MSG I also can’t use dried or dehydrated onions. So how much onion powder would I have to use or could I have the other ingredients read and just add fresh onion? You’d have to experiment with the onion powder as I’m not sure of the exchange amount. Fresh onion would work fine! I would love a recipe for making up powdered gravy mix I could just add to water (or stock), and have gravy mix. yes, I know I can mix fat with flour and water, etc, but I really would love to make a mix similar to the packets of gravy, either brown gravy or our favorite, homestyle gravy. I’m hoping this dried onion soup mix can be used in a cold spinach dip recipe. MSG causes me to have terrible migraine headaches, so I can’t use any of the packaged onion soup mixes I’ve found. Any hints as to make the spinach dip (to be served with Hawaiian Bread)? Thanks! We love cranberry chicken made with onion soup. This is so yummy with garlic mashed potatoes and green beans. Very festive and easy easy easy. In a hurry? Raise temperature and bake for shorter times. Need to start it way in advance? Lower temp as low as 175 and cook for longer. If you like a thicker sauce add only a cup of the cranberries bake chicken for 1 hour and pour off some of the liquid then add rest of cranberry mix and finish baking. Too much chicken? Place uncooked chicken and cranberry mixture into freezer bags in desired sizes and freeze for later. Prefer chicken breast? Yes you can use them but it will never get as sweet because the white meat is too dense. And it will also taste quite a bit different. 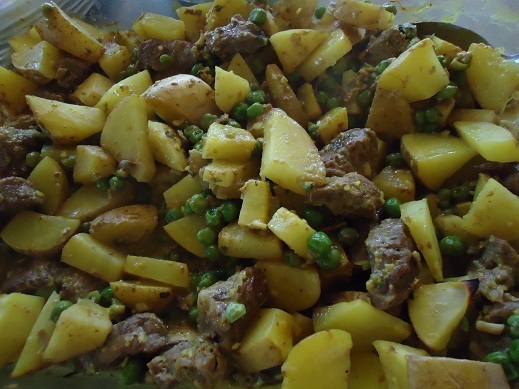 Love the picture of the Beef Stew with the green peas, but cannot find a recipe. Try searching for “Simple One Dish Meat and Potato Meal” on the HHM site. I accidentally found it when I looked under the condiment list for mushroom soup, which the pictured casserole above uses. Of course I remembered this last post and had to reply. Love the condiment list with healthy substitutes! 1 package or 4 spoons of your recipe of onion soup mix! Mix all in a pressure cook (not water needed) and cook for 35 minutes! That’s it! It’s sooooo delicious the meat and the sauce. I needed an onion soup mix without MSG because my son-in-law cannot have anything with MSG. Here’s my favorite recipe with dried onion soup. fill the can up with any kind of wine that you have; sweet, dry, red, white it doesn’t matter. Mix all the ingredients and pour over the chuck roast. Either cook in a 250 degree oven or in a crock pot on low for about 5-6 hours. Is the turmeric neccesary? I don’t ever buy it so don’t have it on hand. I use Onion Soup Mix in the Crockpot. Just put a whole chicken or several chicken parts into the crockpot and sprinkle soup mix on top. Set on High for 6-8 hours. That’s it, you don’t need to add anything else. I use this a couple of times a month and it works great! We learned to like Turmeric by putting some in a cheese shaker and keeping it on a counter. A shake or two over eggs, in meatloaf, chicken, salads, etc. didn’t change the flavor, much at all, as we got used to it and began adding it to all kinds of recipes and we can feel the difference it makes. Why? Turmeric removes inflammation from our bodies. Inflammation is the underlying cause of many serious diseases. Just a thought for those who are interested. We love to make Cranberry Chicken. It takes one can whole berry cranberry sauce, one packet onion soup mix and 8 oz creamy French dressing. Mix together and pour over chicken pieces. I use boneless, skinless chicken breasts. Bake at 350 for about 45 minutes. Serve over rice or noodles. Delicious! I’m really happy you shared this recipe!I love the flavor of onion soup mix, but not the MSG part. I used it for my “Shredded Turkey sandwiches” in the crock pot. Turns out great and very easy! Mix 3 ingredients together, pour over turkey. Cook on low in crock pot for 6-7 hours. Shred and enjoy for sandwiches. Take 1 very big leaf of your favorite variety of lettuce, and use like you would a corn tortilla. Thank you for sharing this recipe. I use dry soup mix in a cheese and onion bread. Mix flour and soup powder together. Mix buttermilk and milk together and add to the flour mixture. Mix until just combined and spoon into a greased loaf pan. Top with the shredded cheddar and bake 45 minutes at 350 degrees Fahrenheit . Thank you for this recipe. I’d much rather cook with a homemade mix rather than the processed mixes. I’ve used onion soup mix in my easy scalloped potato recipe for years. But I also loved using Lipton’s Golden Onion Soup Mix until it was discontinued. Dip chops in beaten egg; dip in onion soup mix; bake in greased dish for 30-45 mins. Put a small pat of butter on each chop. They were so good! Now, I think I could put some granulated instant chicken bouillon in this mix to duplicate the original Golden Onion Mix. Do you agree? Thank you! My last name is Golden, and as I was reading the ingredients on the Lipton Onion Soup packet, I saw several packets of the Golden Onion Soup mix. I was at Publix. You may want to try there if you are still looking for this soup blend. I hope you all realize that this Lipton’s Onion Soup Mix 5th ingredient is MSG. Thank you! This was the first recipe I’ve found without bullion in it. Can’t wait to try it. Mix soup & tomatoes together; put roast in slow cooker; pour soup & tomatoes over roast. Cover and cook on low for 6 hours. You can add other veggies like zucchini and/or mushrooms during the last hour. We serve it over whole wheat couscous. Thank you so much for this recipe. I’m going to make a batch today. I make a pot roast in the oven with vegetables. I use a can of cream of mushroom soup to spread over the roast and then sprinkle on the onion soup mix. Add enough water to the roasting pan to come up about half way on the meat. Put the vegetables around the meat and bake in the oven for about 3 hours. The flavors all blend together. Remove the vegetables and meat and stir in some cornstarch and water to make a delicious gravy. I’m going to start using a mushroom soup substitute that I make with organic ingredients and no msg or artificial flavorings. You reconstitute it with milk and use like a can of cream soup. My family loves this meal and ask for it whenever they all come for dinner. Thank you thank you thank you! It seems like chip dip without MSG would be ready to find, but it’s easier to make thanks to you. Yeah, I’m a big dipper. I kinda like a bit lighter flavor so I don’t put any powders in there. Just dried, minced onions, The dried parsley (it’s just to add color, isn’t it? ) some chives, salt, and dried celery flakes in place of the celery salt. If you haven’t tried this last spice, it’s the bomb! Man! Making me hungry. You are awesome! Hi. I was looking for substitutes for creamed canned soups (UGH!!) in casseroles and saw the comment re making corn tortillas. This is over 3 yrs old and you may have it perfected by now and found that they are really easy once u know. Masa Harina, which is basically a dry corn dough can be found at most grocery stores. it helps to have a tortilla press, as well. If healthy eating is a major concern, corn tortillas are quite healthy, really– gluten-free , low fat and provide fiber, calcium, potassium, iron, and B vitamins. Since the process for corn is specific (see link), it may be impossible to come up with a recipe to equal authentic corn tortillas. If they /the dough breaks up, this is due to not enough binding, which would usually require some type of fat (butter, lard, vegetable oil). In corn tortillas, the dough binds through the processing of the corn (see link). On the other hand, the store bought corn tortillas (In Chicago, there are tortilla factories that produce them) have no preservatives (make sure you have the right brand for this) and contain the same ingredients as the store bought Masa Harina, to which you basically just add water. Be sure you get the Masa Harina for tortillas and not for tamales (unless you want to make those) they ARE not interchangeable. Thanks for all the good substitute for creamed soups in casseroles. I then place a tbsp of meat on top of crescent roll dough ( I haven’t made whole wheat dough yet. Baby steps). They also freeze great and reheat well! I have two excellent (and easy!) recipes that use onion soup mix. Mix onion soup mix, one can cranberry sauce, and French dressing (8 oz.) pour mixture over chicken, bake until done and serve with rice. Cube potatoes and put in a buttered dish. Drizzle with olive oil and sprinkle onion soup mix. Mix throroughly. Bake at 400 for an hour, or until very tender, stirring the potatoes every 15 minutes. These are so yummy, especially with burgers.